Space shuttle Enterprise relaunched on public display July 10, 2013 at the Intrepid Sea, Air and Space Museum in New York City. The second-annual SpaceFest kicks off in New York today (July 25) at the floating home of NASA's space shuttle prototype Enterprise. Through the weekend, the Intrepid Sea, Air & Space Museum in Manhattan, located on the former U.S. Navy aircraft carrier Intrepid, will be hosting a series of space-themed events. Astronauts will be on hand to talk about what it's like to live, work and, well, go to the bathroom in orbit; a LEGO model of Enterprise will be unveiled; and Star Trek: The Motion Picture will be screened on the converted ship's flight deck. The celebration comes just two weeks after the Intrepid opened its new Space Shuttle Pavilion, Enterprise's exhibition area. The original display debuted during last year's SpaceFest, but it had to be closed only a few months later when Hurricane Sandy hit New York and damaged the pavilion's enclosure beyond repair. A free screening of the 1979 film Star Trek: The Motion Picture on Friday (July 26) night. Presentations and autograph signings with astronauts Ellen Baker, Mario Runco, Jr., Charles Camarda, Lee Morin. A free astronomy night on Saturday (July 27), with local astronomers on hand to help visitors navigate the cosmos. The unveiling of a 3.5-foot LEGO replica of the Space Shuttle Enterprise on Friday (July 26). Interactive displays and demonstrations of gadgets like virtual goggles that take visitors into outer space, 3-D printers, and design-it-yourself lunar landing video games. NASA used Enterprise in approach-and-landing test flights in the late 1970s. Though the test plane never went into orbit, it paved the way for the space shuttle program, which retired in 2011 after 30 years and 135 missions. 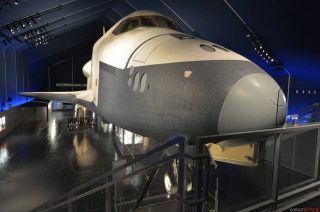 Enterprise had been on display at the Smithsonian's National Air and Space Museum annex outside of Washington, D.C., until it was moved to the Intrepid in 2012. The rebuilt pavilion is only a temporary home; the Intrepid plans to build a permanent facility to display the test shuttle near, but not on, the aircraft carrier.